Council Matters: Cannabis store, Rec Committee, urban trails, taxation . . . Present: Mayor kathy Moore, and Councillors Chris Bowman, Scott Forsyth, Stewart Spooner, Andy Morel, and Janice Nightingale. Absent: Dirk Lewis. Public Input Period was very quiet -- no one offered to speak. A motion to provide a letter of support for a local resident applying for permission from the Liquor and Cannabis Regulation Branch to open a non-medical cannabis retail store, to be called “Jimmy’s Cannabis Store,” at 2127 Columbia Avenue, CARRIED unanimously. The proposed store hours are from 10:00 am to 7:00 pm Monday to Saturday, and from 10:00 am to 5:00 pm Sundays. The City had asked for input from residents by way of a public notice in a (hard-copy) newspaper, and received no responses. Spooner asked if the City had placed any limit on the number of cannabis outlets; Moore explained that the former council had decided not to impose any limits, but to allow competition to do the job. Also moved up: a motion to give first and second reading to Zoning Amendment Bylaw No. 2692, 2019 (1) – 2770 Butte Street, and to schedule a Public Hearing for March 11, 2019, and that the owner post a sign on the property describing the plans for it, CARRIED unanimously. The amendment would rezone the property from R1 (Residential – single detached) to R1-I (Infill Residential) and permit the lot to be subdivided into smaller parcels; this would require changes to the existing buildings on the property. Morel asked about snow storage issues. City Planner Stacey Lightbourne explained, that would be dealt with at the subdivision stage. 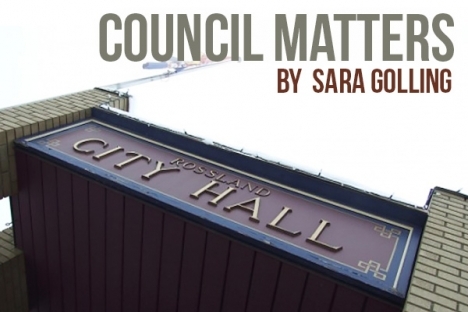 THAT Council directs staff to explore the opportunities to fund a third party to develop a Rossland Recreational Master Plan. A motion to adopt the minutes of the January 24 CoW meeting and its recommendations CARRIED unanimously. A motion to adopt City of Rossland Land Development Applications Procedures Bylaw No. 2690, discussed at the previous meeting, CARRIED unanimously. A motion to give first and second reading to Zoning Amendment Bylaw No. 2693 for 1988 First Avenue and set a Public Hearing for March 11, 2019 CARRIED unanimously. The amendment is to remove short-term rental zoning from the property, as the owner no longer wishes to use it for that. The zoning will revert to R1-I (detached infill residential). Councillors wished that the removal of zoning for short-term rentals could be made automatic, or at least less onerous, when no longer wanted or for non-compliant owners, but Lightbourne explained that the rules don’t allow that. A motion to approve the draft Memorandum of Understanding between the City and Rossland Council for Arts and Culture regarding the use of the Miners Union Hall, and RCAC’s improvements to it, for the next three years CARRIED unanimously. More and better trails in town! A motion to direct staff to apply for grants to upgrade and complete as many as possible of Rossland’s urban trails for pedestrian and cycle use, to improve safety and encourage more walking and pedaling, CARRIED unanimously. Chief Financial Officer Elma Hamming presented Council with a summary of taxation trends, with information on Regional District requisitions for the past several years, for information purposes only. Interested readers can find the material here, starting at page 90 of the document. Spooner noted an 83% increase in the cost of Victims’ Services recently, and Moore explained the the Province has kept its contribution flat for a very long time, but costs have kept increasing; it’s one example (of many) of the Province downloading costs onto municipal governments. Rossland’s contribution has risen more than other local communities’ because many of the requisitions are based on property assessments, and they’re higher in Rossland. Nightingale commented that, even so, Rossland’s total contribution has gone up only about 4% more than the other municipalities. Moore noted that the sewage treatment upgrade project, with a budget of about $52 million, will likely be “dead in the water” if grants for it are not forthcoming. A motion in response to a request from J.L. Crowe Secondary School, to continue to offer two scholarships, the $350 Rossland Award and the $250 Rossland Health Awareness Award, CARRIED unanimously. Spooner explained at the meeting that he would like to direct more attention to policy issues rather than operational ones. Moore noted that the purpose of some of the liaison positions is communication and engagement. Morel said the Council involvement is important to the organizations, such as the library. Bowman said that from the point of view of Tourism Rossland (when he was with that organization) it was “invaluable” to have the Council contribution. Nightingale pointed out that many of the organization are run by volunteers and Council engagement encourages the huge contribution volunteers make to the community. The motion FAILED with only Spooner in favour. Bowman commented that the presentation at the Asset Management workshop was excellent, but “needed more people!” -- only three members of the public took advantage of it. BC Heritage Week is from February 18 to 24 this year. Bowman met with the Affordable Housing Society and architects on Sunday and toured the Emcom lot, working toward finalizing plans for what will be built there. Nightingale reported that she met with a specialist in real estate markets for long- and short-term rentals. She added that there will be a public information meeting about the Emcon lot development, tentatively planned for the first week in March. Morel reported on RDKB meetings and mentioned the increase in East End Fire Services costs. Bowman asked who controls the spending; Moore responded, “the Board authorizes spending; ‘controls’ might not be the right word.” Morel said that the liquid waste management project is now “shovel ready” and just waiting for word on grants. Morel noted that the family interested in starting a cycle-oriented family retreat centre has found suitable property down on Hwy 22, in Area B. They had failed to get re-zoning for a property closer to Red Mountain a few years ago. Council recessed to an in camera session, and your reporter bundled up in her puffiest coat and perambulated home, looking forward to a time when Rossland’s urban paths have been further extended and improved. For winter use, might they be packed by the little machine that has been packing some of the non-urban trails to facilitate use by fat bikes and walkers? It seems to do a fine job, and it might possibly cost less than a plowing and gritting regime. It would also greatly diminish the snow storage problem along the paths. Of course, it would be best to pack the paths double-wide with it where possible, or at least to pack frequent “pull-outs” . . .